The success of an online store depends on dozens, if not hundreds of little details. You never know what piece of information displayed on the product page will play the ultimate role in shaping customer’s opinion about the products on sale. That is why it always makes sense to provide as much product information as possible, without cluttering a page and losing its sleek look. In this article you will read about Top 6 most important things to be found on a product page and a convenient Prestashop tool to arrange them properly. Some will appreciate visual details of the page, others will be drawn to creative product description. 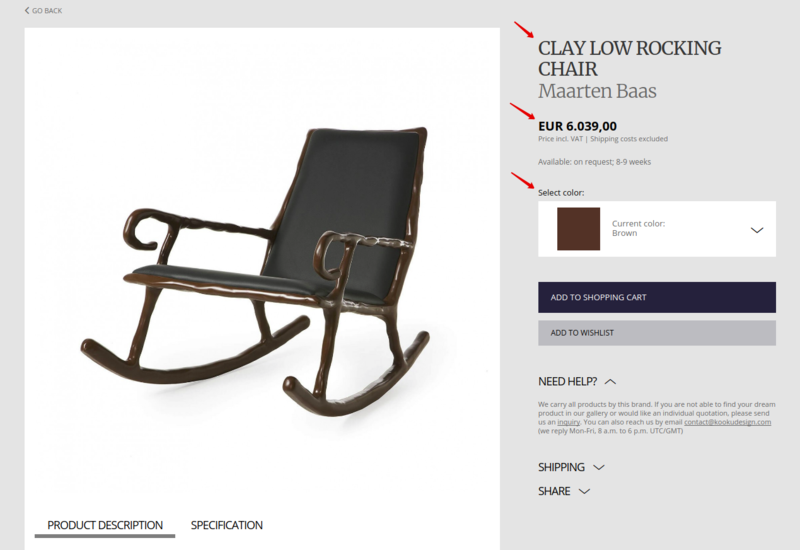 However, there is a number of things, which all product pages should inevitably have. These are pieces of information, that provide customers with key product data, namely product title, price, size and color variations. All of them are supposed to stand out and be distinguishable from other elements on the page. This is the first thing that catches customer’s eye on the page and provides the first impression of the product, so it is worth paying special attention to it. Make sure all of the uploaded images are in high resolution. 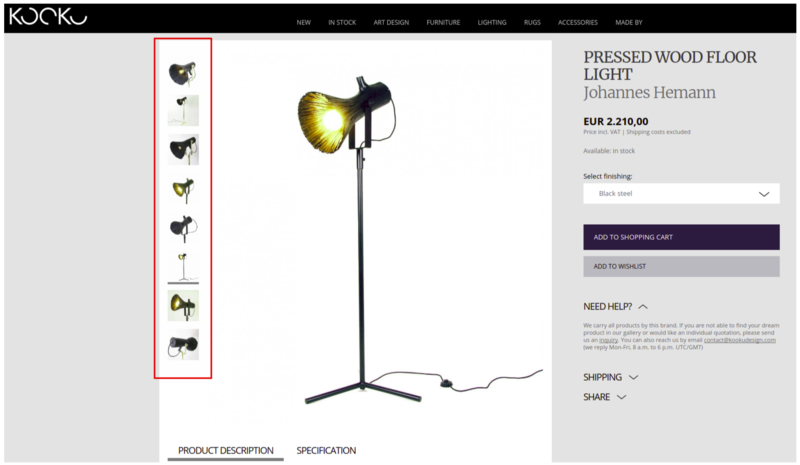 Upload various images that show the product from different angles. It also makes sense to upload product images with white background in order to focus customer’s attention exclusively on the product. If your product comes in different color variations, those need to be represented here as well. Check out the KOOKU example once again to see how all of these points are implemented there. Product descriptions allow your clients to glimpse at what the product on sale is about and learn its key features that are not visible on the picture. Product descriptions give you the opportunity to insert the keywords and phrases to make a product page search engine friendly. 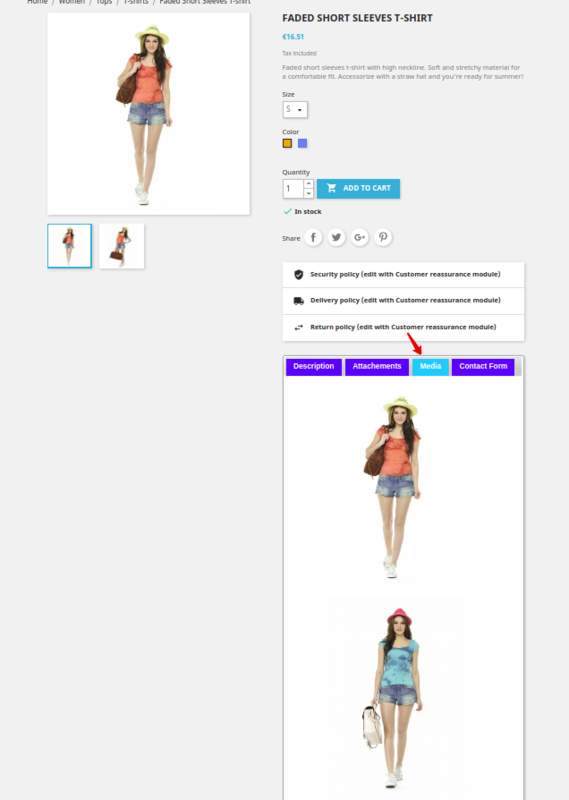 This allows customers to view the product they are going to purchase in a way which would be impossible through static images alone. For business owners it’s a huge space for creativity, allowing them to demonstrate a product in the best possible light: catwalk videos, product reviews, head-to-head comparisons, etc. With all the above-mentioned information presented on a product page, something may still remain unclear to potential clients. To establish bilateral contact and receive valuable customer feedback, think about creating a Contact form on the product pages of your store. The amount of information that can be displayed on a product page is not limited, however, the challenge is to preserve the consistent structure of a page without cluttering it with all sorts of stuff. User guides and manuals usually contain a great deal of information that cannot be ignored, however, neither can you dump all of it onto the page. The solution is to upload it in PDF documents available for download. Here comes the most interesting part: we can offer a tool that would allow to add all of the above-mentioned features on a Prestashop product page and arrange them beautifully there. 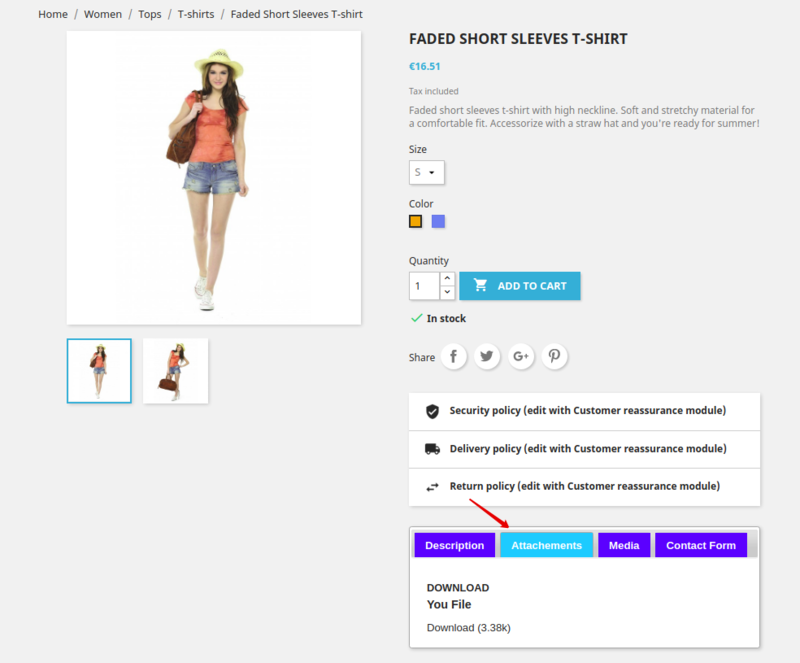 The module lets a user create and add extra tabs on the product page as well as displaying additional information about most important products in the store. 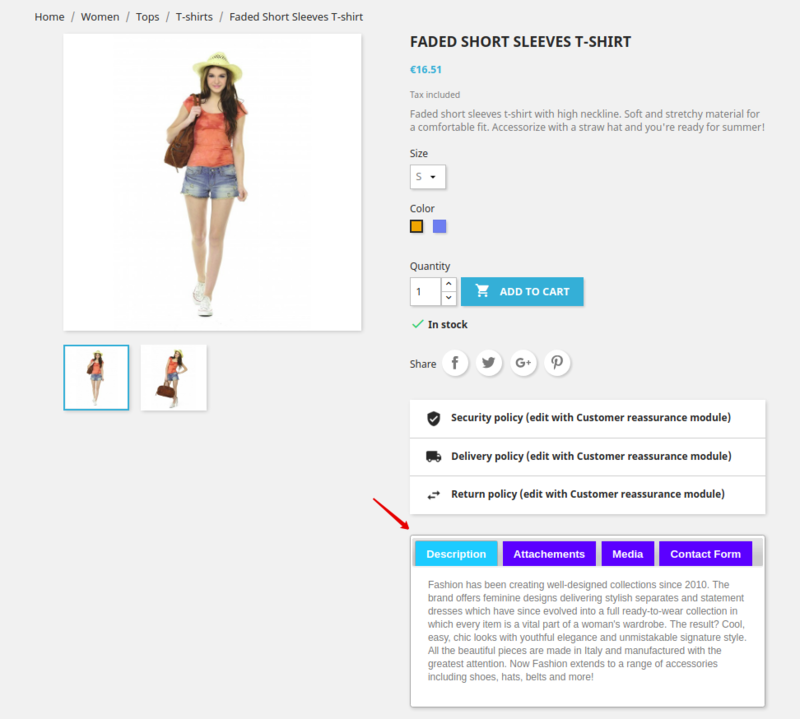 Let’s take a closer look at how it can display all of the mentioned key components on a product page. Product description tab lets you show all the detailed information, that you won’t otherwise include into main product description. Besides adding detailed product description, the module also lets you create tabs, where visitors will be able to download various text documents, such as manuals, recipe books, user guides, etc. Media tab gives the opportunity to upload video reviews on the available products and additional product images that would otherwise be superfluous on a main product page. Another convenient feature of this module is Contact form tab, which allows customers to ask a question about a particular product and clarify certain details, thus establishing bilateral communication between customers and sellers. You can take a look at Product tab module Demo and appreciate the advantages this module brings to business owners. The module is available at our store.